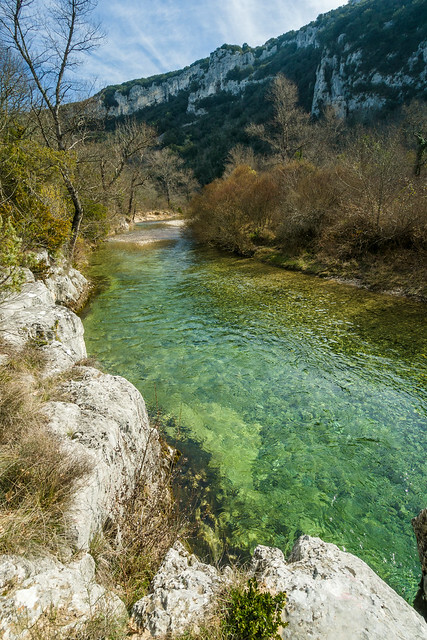 The mouth of the canyon near Saint-Martin-d’Ardèche. 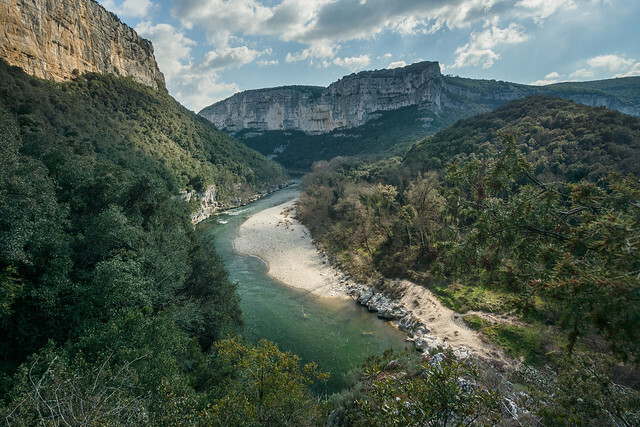 Two weeks ago a made a short but powerful visit to the canyon of the Ardèche in southern France. 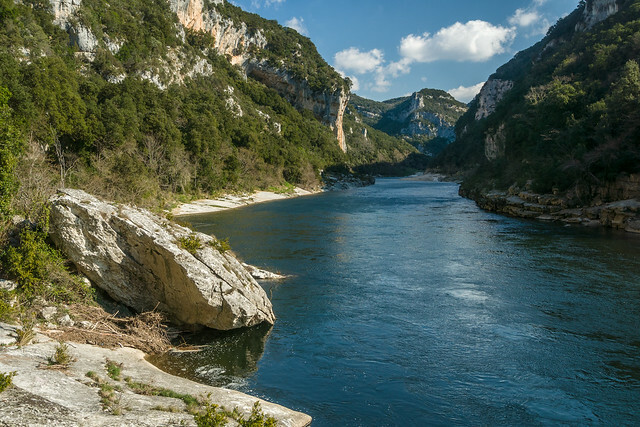 The Ardèche river has its sources in the limestone Cevennes ranges of the Massif Central and wines its way southeast in search for the Rhone river. On its way the river cuts itself through a short beautiful canyon. 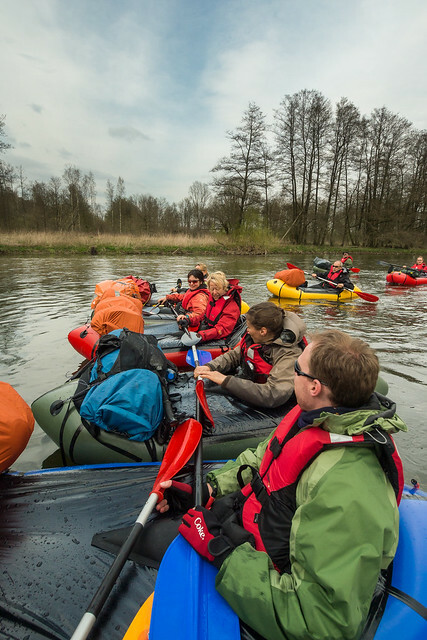 This canyon is very popular during the summer months when the river has almost no water left in its stream bed and each day a horde of tourists floats the river through the canyon in a rented kayak. 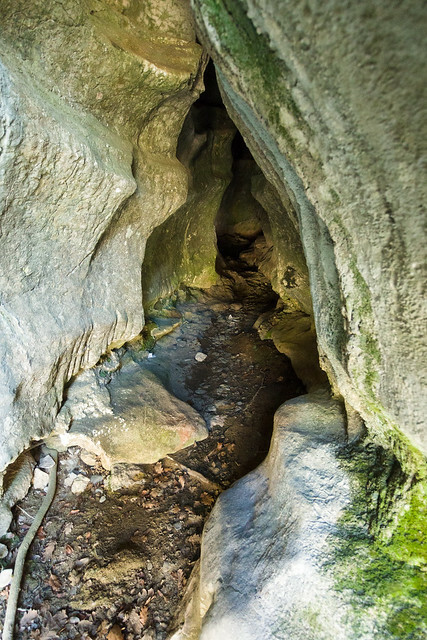 Many caverns can be explored down the canyon. During winter however, the canyon is an empty place for you to discover in all peacefulness. There is a reason why it remains so quiet down there during winter. 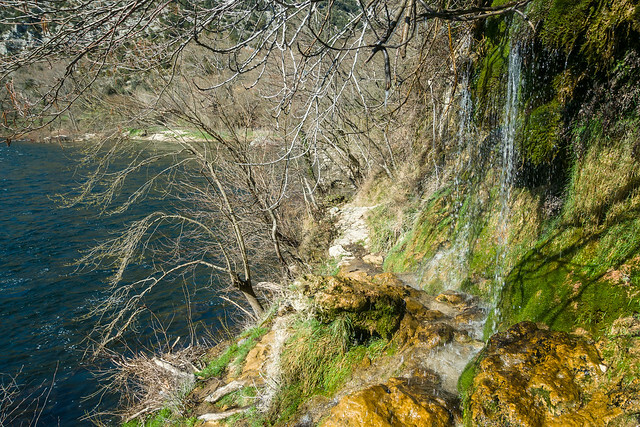 While entering the canyon, the trail immediately runs along a passage over a steep rock slope above the river. A portion boulder hopping is not lacking either. 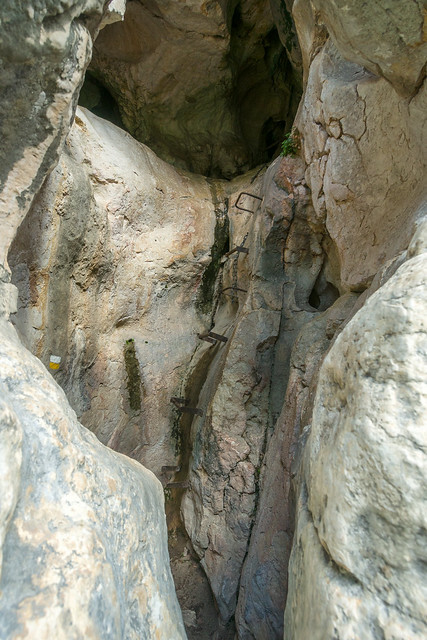 A hiking trail runs through the whole canyon, but as is usual with a trail through a canyon, there are a few difficult sections where the trail passes over small ledges or tries to bridge steep rock faces. The trail even so does not stay along the same side of the river throughout the whole canyon. To be able to surpass beyond some vertical rock faces one should ford the river at least twice as there are no bridges. During the summer months these river fords are most of the time an easy and fun undertaking. 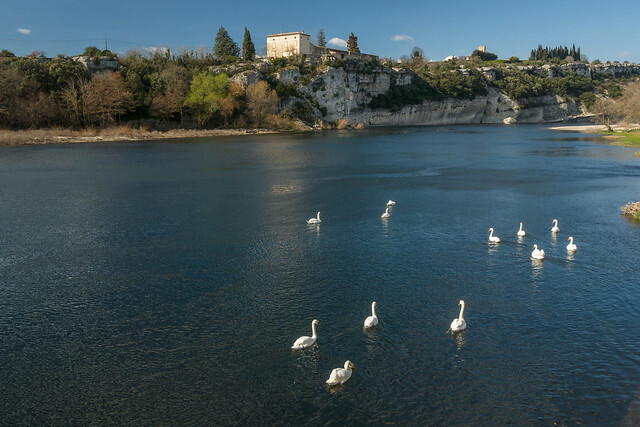 During winter however, the higher water levels and the stronger current will take you straight away if you would be so fool to try to fight or swim the icy cold water. 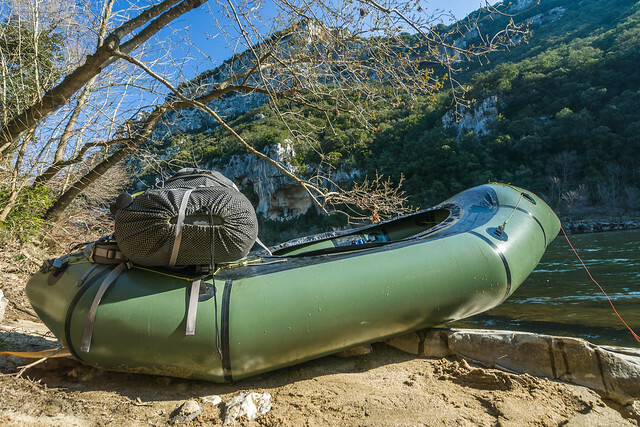 But for all those with a packraft on (or in) their pack, this deserted place may still be a little adventure to discover during the winter as the river is the packrafter his friend and not an enemy. Looking back through the first meander bend in the canyon. 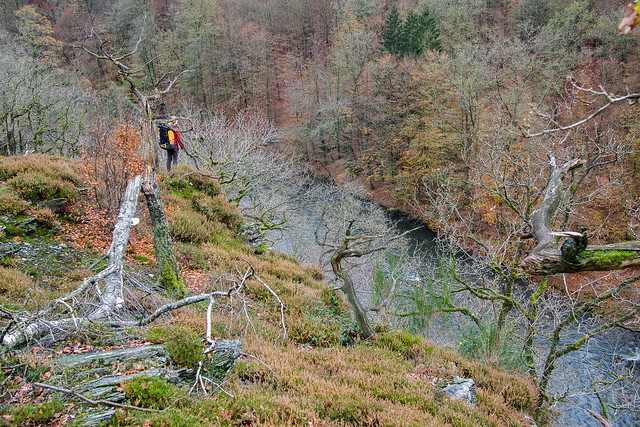 The trail continues over this fantastic narrow ledge which was very slippery at some places by the seeping water. 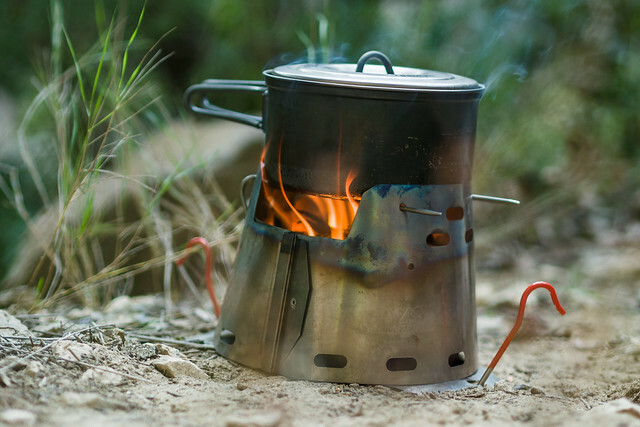 All the time a strong mistral breeze was blowing in my face while I hiked upstream through the canyon. 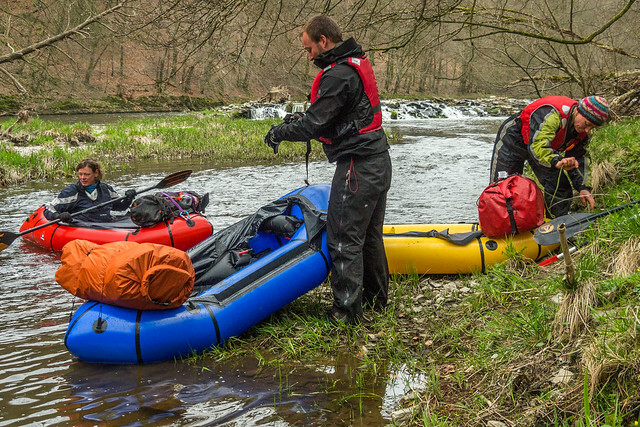 On many occasions the winds were too strong to be able to packraft the river. Luckily I had studied the weather forecast beforehand and knew the mistral would die after two days so I could packraft back through the canyon. A little further another narrow ledge above the river leads you towards a chimney by the use of secured cables and pins. The chimney is left through a natural tunnel in the rock. I had to take my backpack of and lower it down to clamp it between the rocks in the foreground of the photo to be able to make this passage safely and retrieve my pack later. The trail continues along cable section in the rockface. However, during the weekend a lingering coldfront would probably bring several tenths of millimeters of rain and temporary rising temperatures which would partly melt the snowpack in the upper reaches in the Cevennes range. 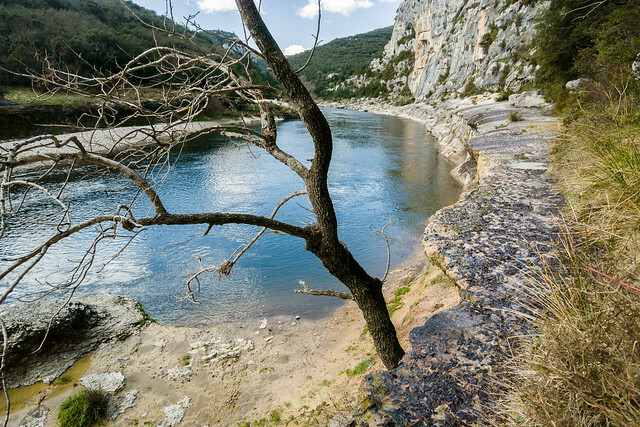 The Ardèche river is known for its rapid rise in water levels during such events of heavy rain. 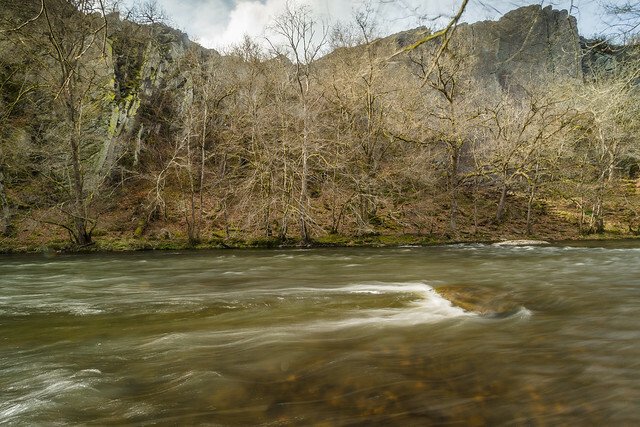 Water levels can rise with several meters in just a few hours down the canyon and the relatively quiet river with its small class II rapids then changes into a turbulent brown stream full of treacherous whirlpools. Another grateful shelter from the mistral wind. My goal was not to procrastinate and hike quickly through the canyon and then packraft back over the river before the heavy rain would make it too dangerous. 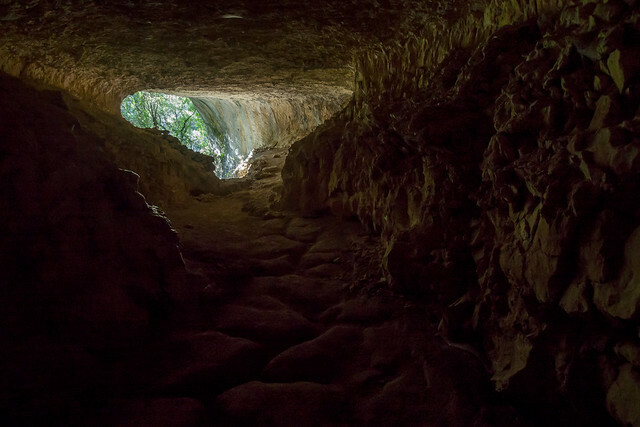 I passed many interesting ledges, steep sections along limestone faces where cables or pins in the rock secured the passages and sometimes explored a few of many mysterious caverns in the limestone rock where I was happy to be out of the mistral breeze for some time. Looking back through the Cirque de la Madeleine. Another point where you’re standing astonished in front of the next rock face while wondering how the route would continue this time. At one spot just downstream of a rapid in the river, the trail went over a small ledge which was flooded by the higher water levels. 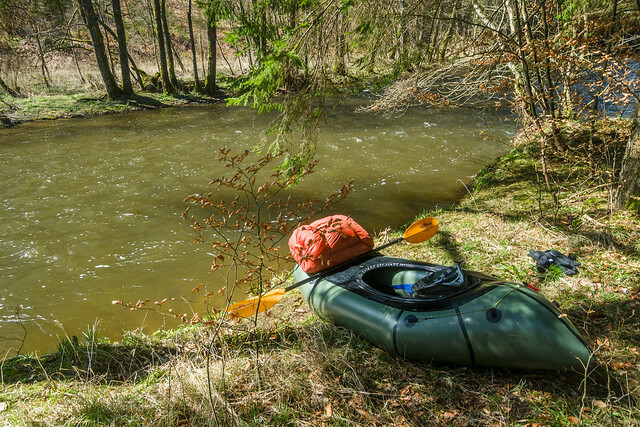 It was impossible to pass this spot in my packraft as I couldn’t paddle upstream through the rapid. I didn’t want to return here and so I cautiously shuffled over the slippery ledge while wetting my feet in the icy cold water while searching with my hands to something in the limestone face to hold onto. And so I eventually hit the other dry side still well and truly. 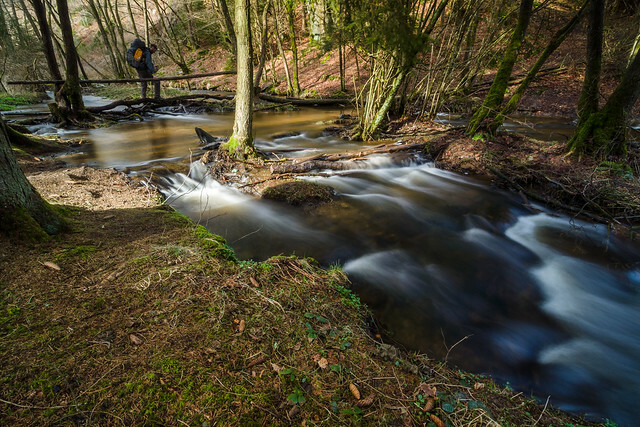 Approaching the river ford Gué de Guitard, now impossible at high winter water levels. 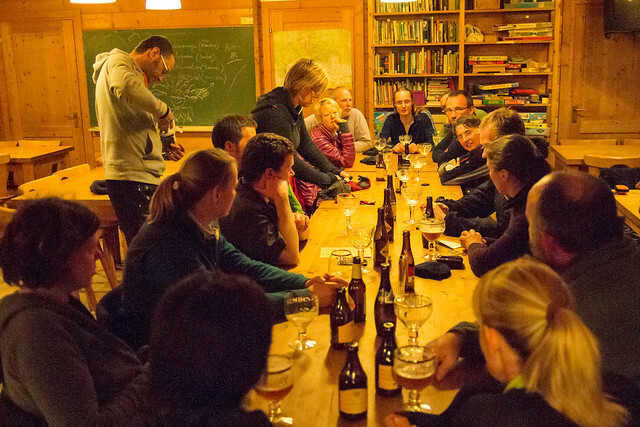 Looking forward to a hot meal after a whole day fighting the cold channeled mistral breeze in the canyon. 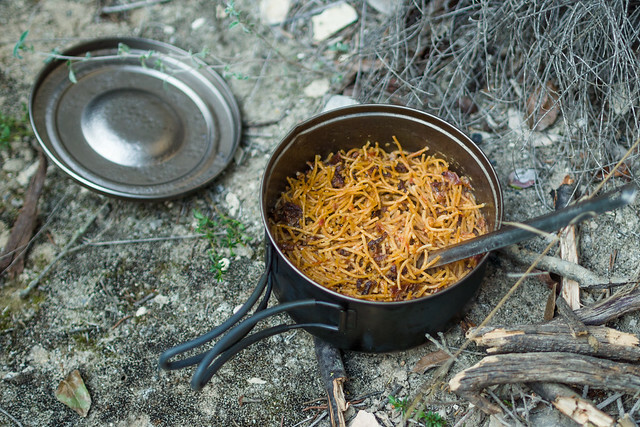 Delicious home made and dried spaghetti. 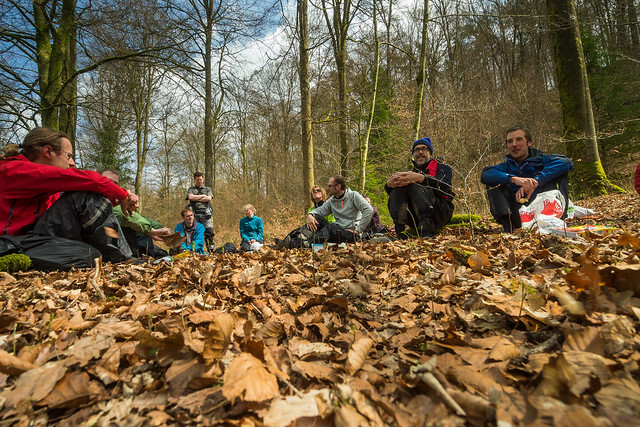 The bivouac spot above Gué de Guitard. 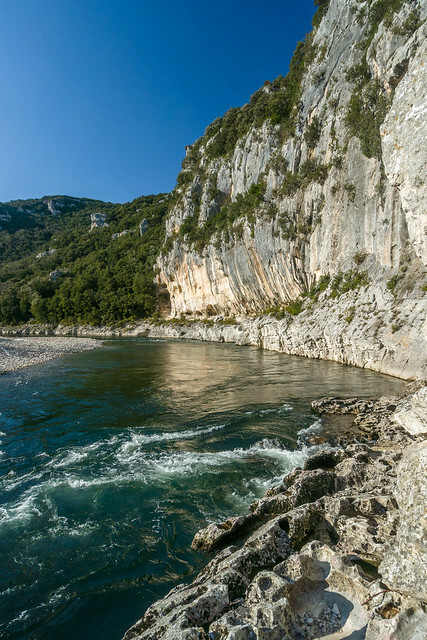 Above the first river ford, named Gue the Guitard in French, I found my first bivouac spot for the night on a piece of sand under an overhanging rockface. 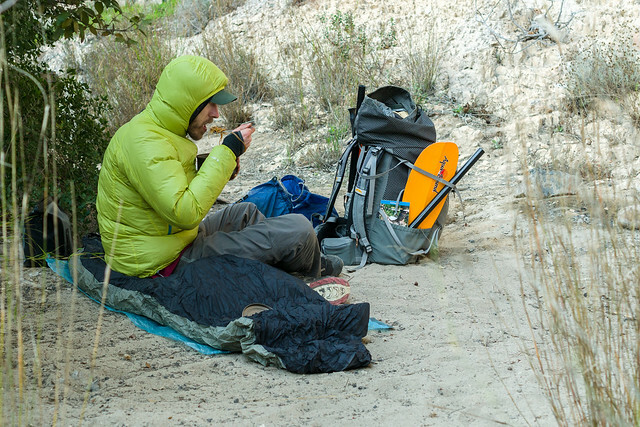 Despite a few snowflakes that fell from the sky during the evening, I slept in my bivy bag and didn’t pitch the tarp. Temperatures dropped just below freezing during the night. 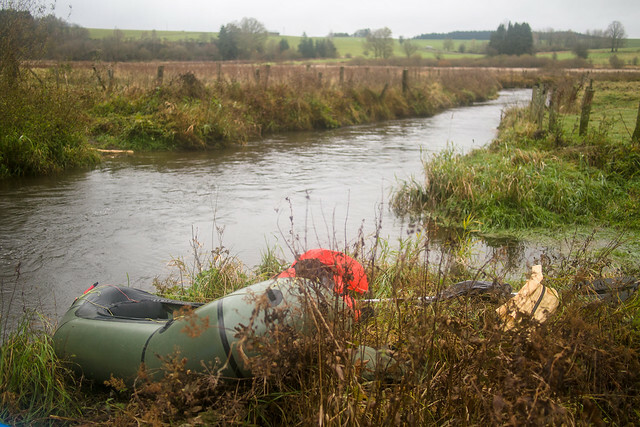 I crossed the river in my packraft at the river ford which is impossible to even try during winter. A sign announces the ford. Note how great the French are able to write in English. 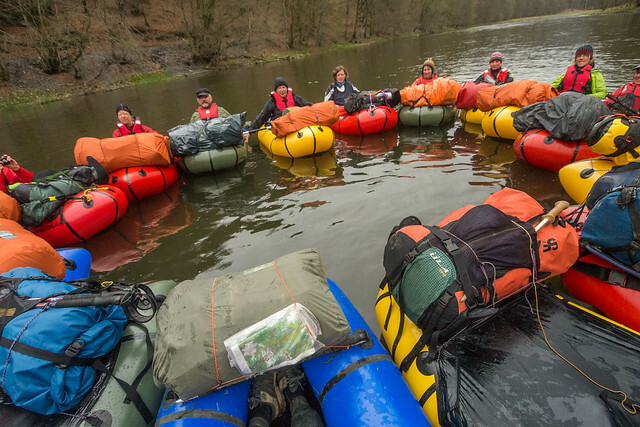 When packed during the morning my first task was to inflate my packraft and paddle to the other side of the river to continue the trail. Along the left side of the river the canyon showed its wildest side. The sun shone exuberantly and soon reached the bottom of the canyon. Time for a break. 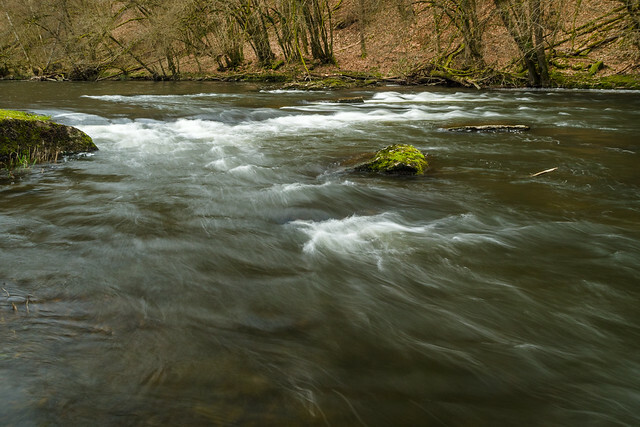 I laid myself down in the grass above a gravel bank and enjoyed the rushing river and the silence beyond the blowing mistral wind. Here starts the wildest and my favorite section in the canyon, upstream of bivouac the Gournier. After crossing the next ford. After about two hours the trail ended again onto a vertical wall and so I inflated my raft again to paddle to the right bank. 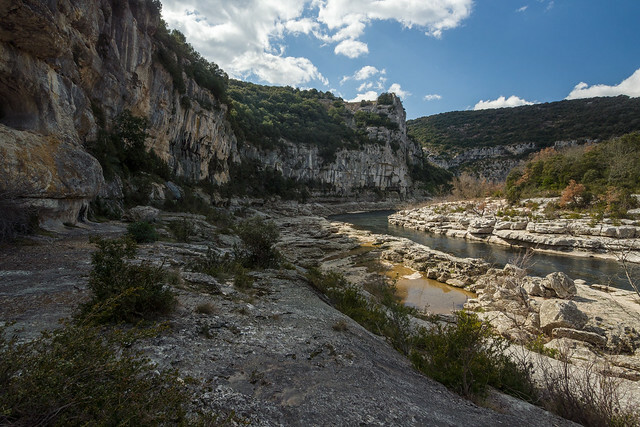 It didn’t took much time anymore before I reached a canyon like side valley where I left the canyon of the Ardèche. I explored a small trail through this valley and passed the Pissevieille cascade, an impressive looking waterfall that falls of the rim of the canyon into the deeps, at least on the picture of my hiking map as the stream was dry now and I only could spot the dry creek bed incised in the limestone on the rim. A vaucluse spring is wetting the trail. Through the beech forest above the canyon. The path climbed out of the valley in a few zigzags and there I was, standing on the limestone plateau in a deadly looking landscape with the depths gaping behind me. 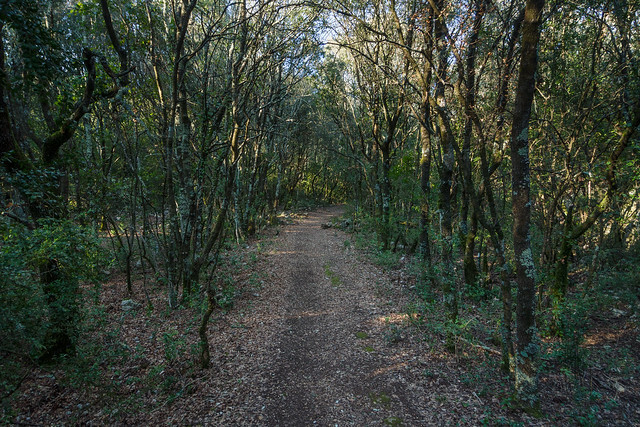 I followed a 4WD track until I stumbled upon the markings of the GR4 trail, which I followed for some time into the beech forest on a narrowing path. 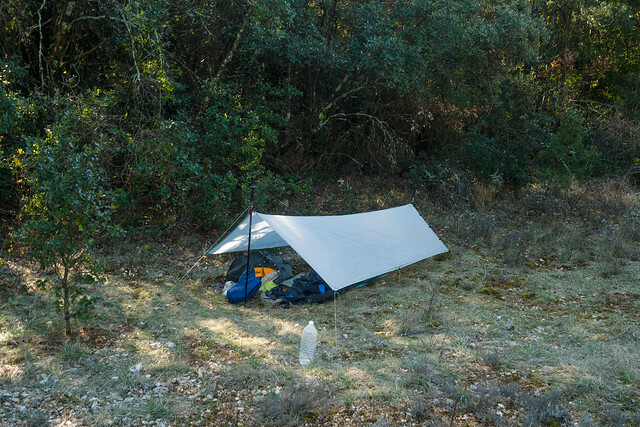 Bivouac on the heights above the L’Ibie Canyon. In a clearing in the woods I pitched the tarp and went to bed around sunset. During the night I got awake a few times, the first time by deer running through the forest. Later on by noisy boars that even came very close to the tarp in search for something nourishing under the grass. 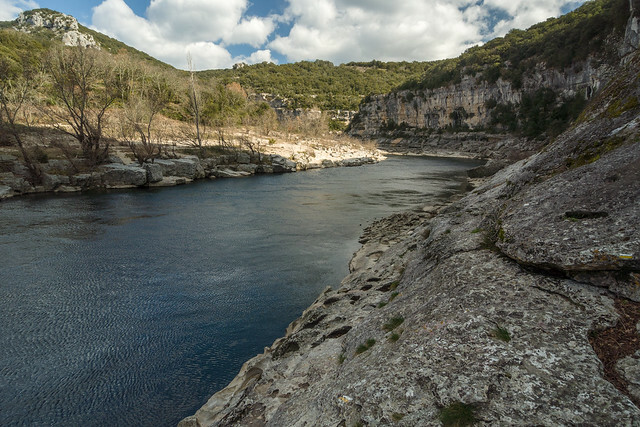 The L’Ibie river before it enters its short canyon. 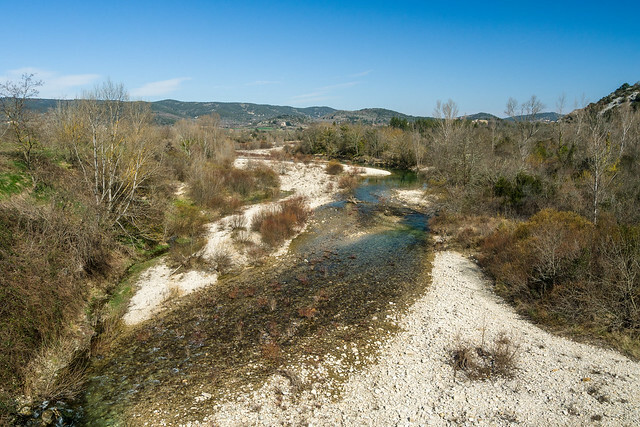 During the morning I descended from the plateau into the valley of the L’Ibie river, a small side stream of the Ardèche. 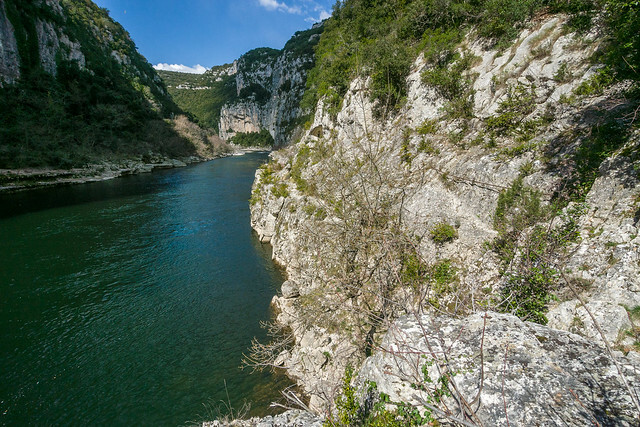 I followed the river downstream through its short canyon and hiked into Vallon Pont d’Arc at noon. The village looked dead now outside the tourist season. 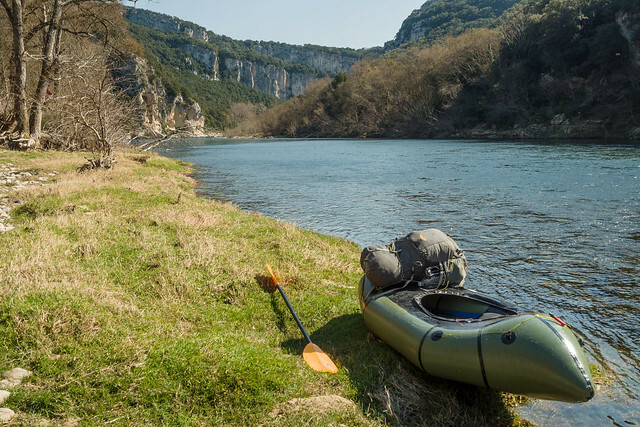 At the bridge over the Ardèche river I inflated my packraft and started the float downstream through the canyon. The weather has been changing rapidly now and the sun disappeared behind a thick layer of grey clouds that soon invaded the whole sky. I forgot to take my gopro at home and so was not able to record my float on the river unfortunately. 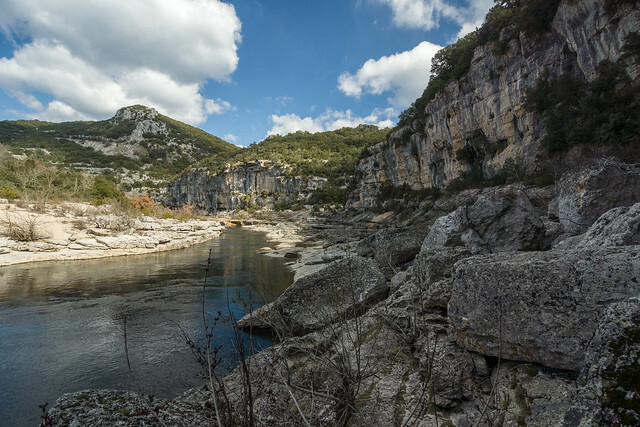 Hiking back towards the Ardèche through the L’Ibie Canyon. I passed under the famous arch just before the entrance of the canyon and then paddled through the easy rapids while enjoying the scenery from below on the quieter section in between. 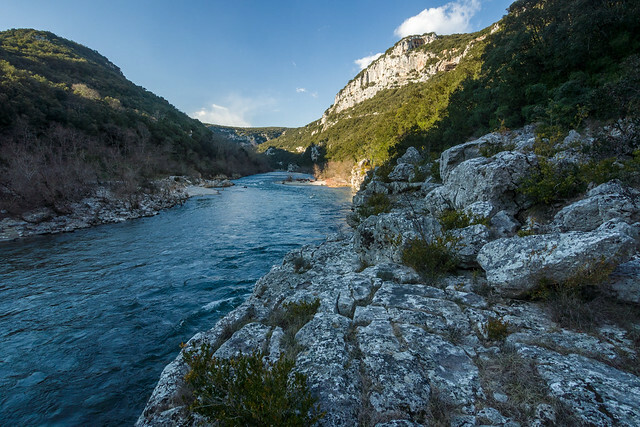 Passed halfway it started to rain and when I reached the last kilometer near the end of the canyon before Saint-Martin-d’Ardèche the wind became so fierceful blowing in the face that it became impossible to paddle further downstream. I put out and walked the last kilometer out of the canyon towards the village. 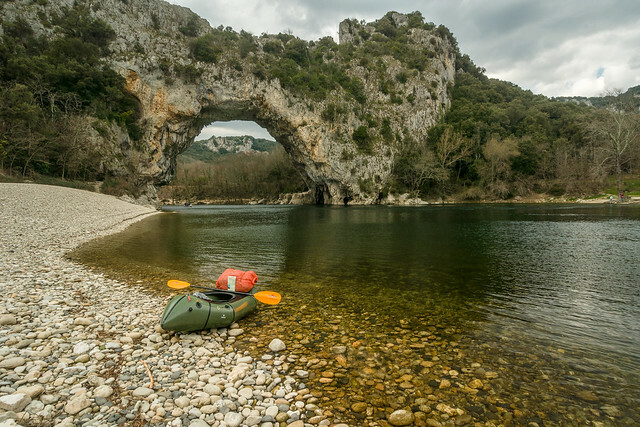 Stop at the famous arch above the river Ardèche. Arrived in the village the rain became a rainstorm while I could witness the rivers water level rise by each minute. 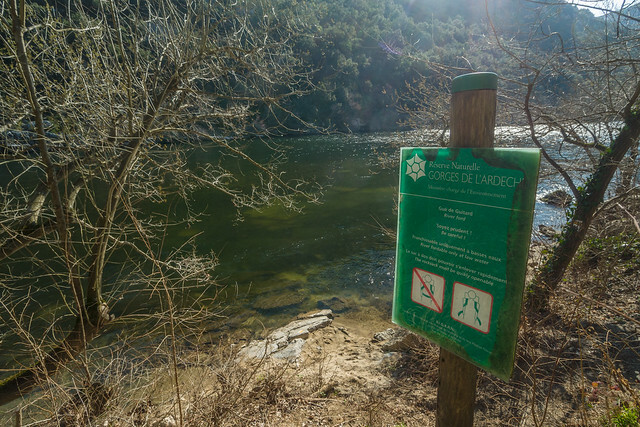 At home I noticed online that the gauging station in the canyon had registered a rise of the water level with about 2,7m in just a few hours that followed, the river discharge rising from 65m³/s to a peak of 740m³/s. I had just finished in time. 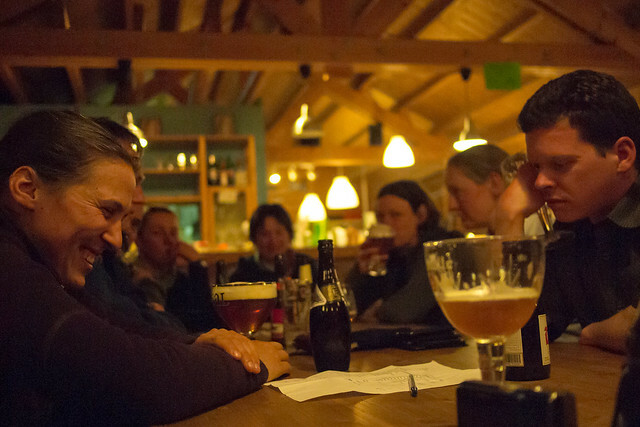 Yesterday Yves, Willem and I went to the east of Belgium to start a run on the river Grensmaas. 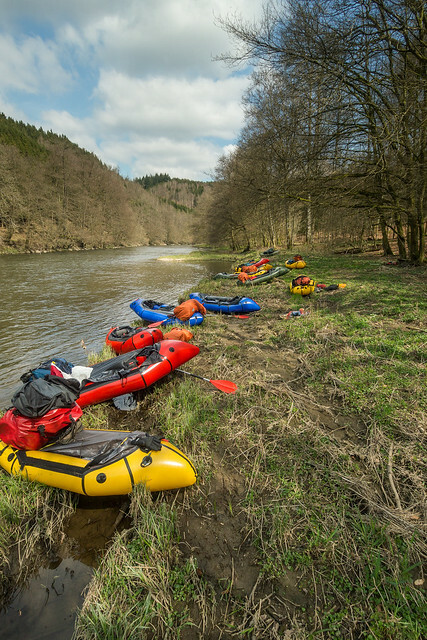 The days before we had made the plan to go on a multi day packraft trip in the Ardennes but the abundant rainfall of the previous days resulted in dangerously high water levels so that we made the decision to divert to the Grensmaas. This became my fourth run of the river, this time however at a discharge of 1300m³/s, instead of the 50-200m³/s I was used to the previous times. We only needed less than half the time to run the 37km to Maaseik, our average absolute speed about 12,5km/h. At some points the fields next to the river were standing under water and made ​​it at some points confusing to determine where the real riverbed went again. All the rapids were now flattened out, but that could not spoil the fun. 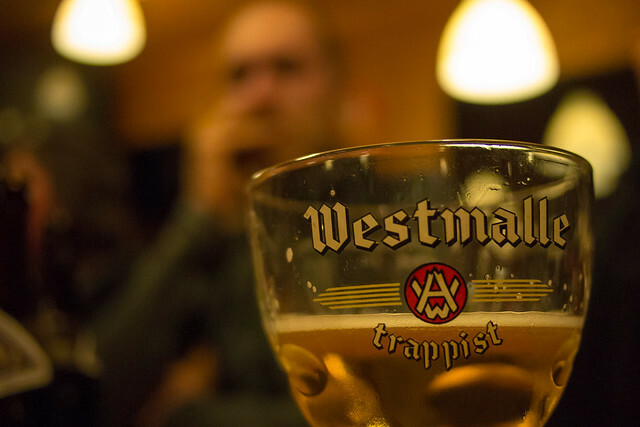 The Grensmaas is equally enjoyable at any water level. 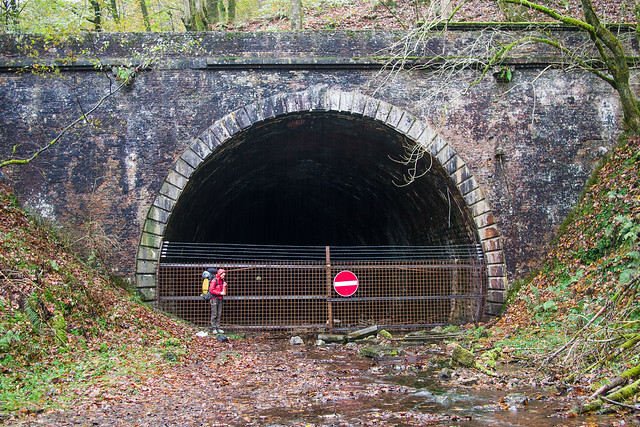 The 1350m long Ste-Cécile tunnel has long been the longest tunnel in Belgium. At the beginning of the 20th century a very controversial railway was built in the south of Belgium. L163A as is the name of this railway is undoubtedly a difficult feat in the history of the Belgian railways. First of all this railway should never have been built. It runs through the south of the Belgian Ardennes and the Gaume region and was built with the goal to connect the Belgian rail network with the French rail network to create a fast connection with the – at that time – thriving industry in the basin of the Chiers river just south of the border. 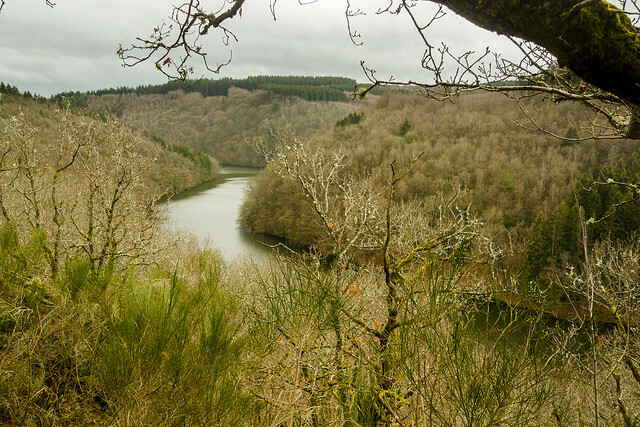 The most ridiculous is that this connection could have been built rather easily near the village of Florenville. However due to local political interests the railway was finally built more to the west over a very difficult and hilly path. 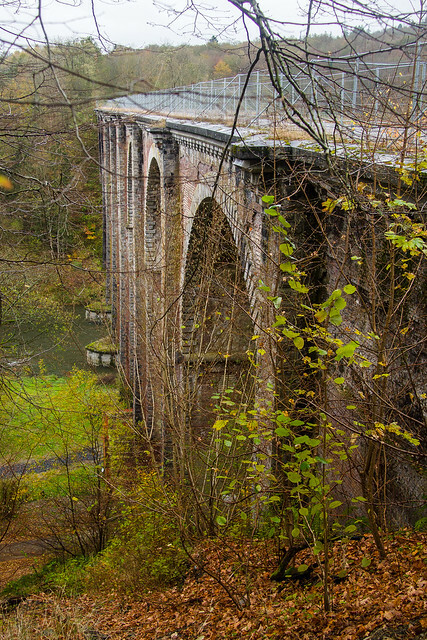 It then took 12 years to build the 26km long railway which finally contained 3 viaducts, 3 tunnels and 24 bridges. Eventually the railroad has never been very useful except for the German occupiers during both World Wars. The Ste-Cécile tunnel is closed to the public but real adventurers still now how to enter by climbing over the fence and wires. 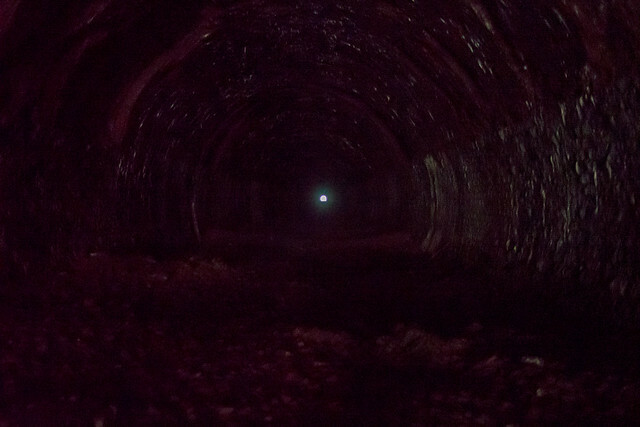 Lots of bricks fall from the ceiling in the Ste-Cécile tunnel and make for a dangerous enterprise. Today the railroad hasn’t seen a train anymore for 4 decades. 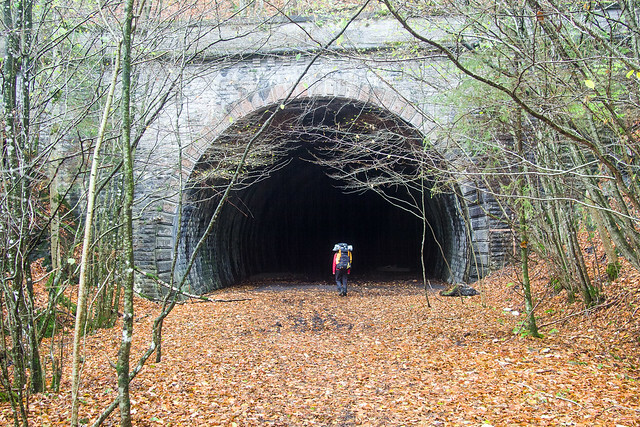 The railway itself has been broken down, but the track bed including the tunnels and viaducts are still there today, albeit in various stages of decay. Technically speaking it is possible to hike, or lets say to railtrack most of this ancient railroad, an interesting adventure as some parts of the route are changed into a jungle. Furthermore all the 3 tunnels are by law forbidden terrain, but that makes it an even more exiting adventure, isn’t it? 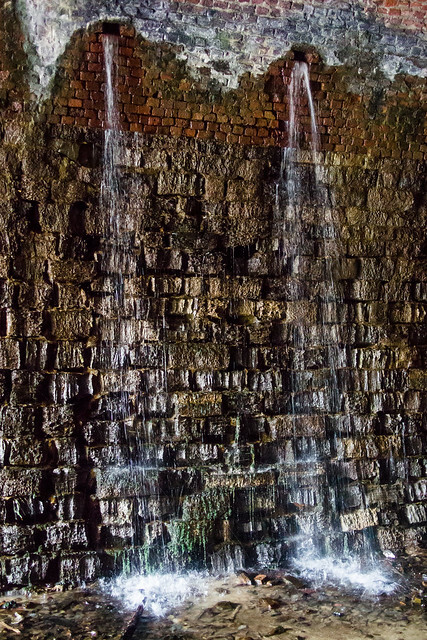 Water was seeping through the ceiling of the Ste-Cécile tunnel at several places during this very rainy day, creating a stream of water over the bottom of the tunnel. Luc Selleslagh is under the spell of this railway line and has throughout the years examined the history of the railroad. 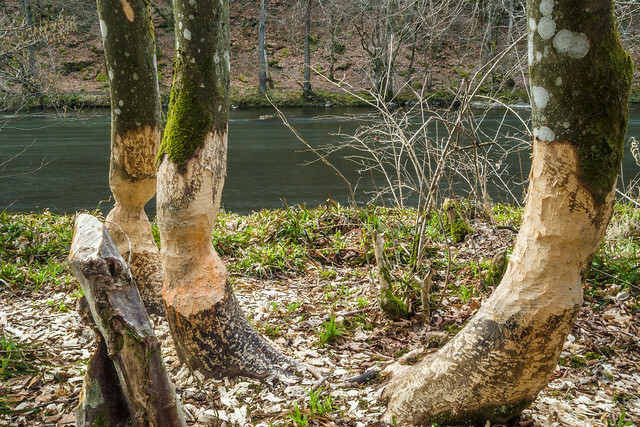 His work can be admired on his site trekkings.be. You will not only find the into detail history of the railroad on his site, but also handy tips to explore the railroad on foot with the latest updates of the situation at the critical points. If you ever feel attracted to go railtracking overhere don’t hesitate to sift through its pages. 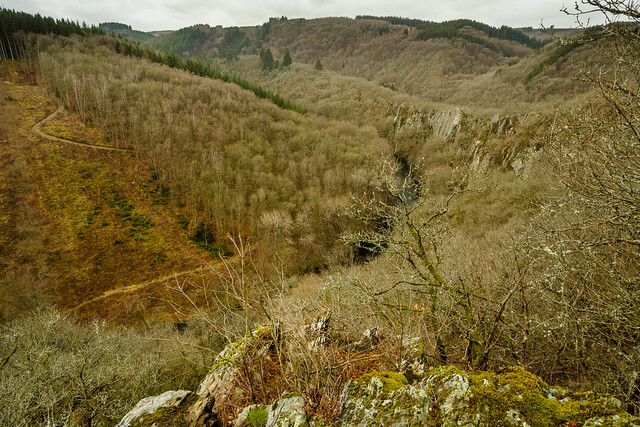 Conques viaduct over the river Semois near the village of Herbeumont is 38m high and 160m long. Now, what is so interesting for us adventurers with a packraft is the fact that this ancient railroad makes a very fast connection between the river Semois near the village of Herbeumont with the river Vierre near Martilly and so an interesting and very varied round trip can be made here in the south of Belgium, both combining hiking/railtracking over bridges, viaducts and through tunnels with packrafting over the rivers. 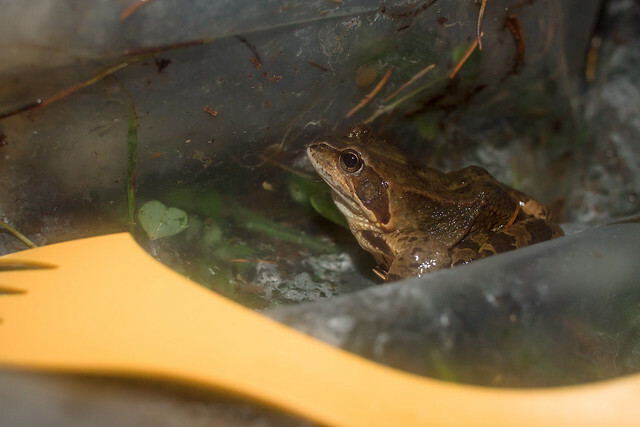 A frog kept us company while seeking shelter from the rain under the trailstar. 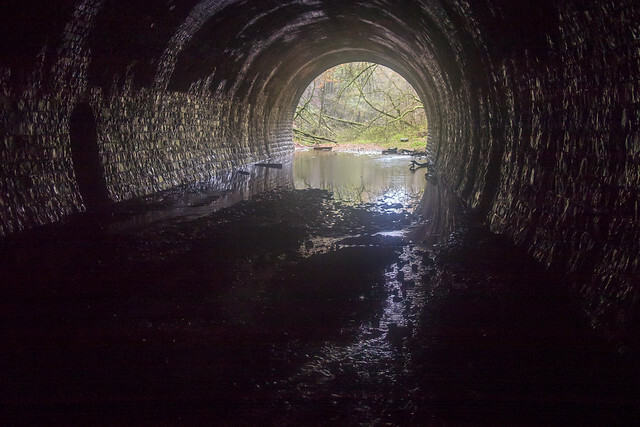 The St-Médard tunnel is the wildest of the three tunnels and is always standing under water over a short stretch, forcing you to wade through shin deep water and mud. Last weekend tons of rain were forecasted and me and a friend were eager to go explore this round trip. 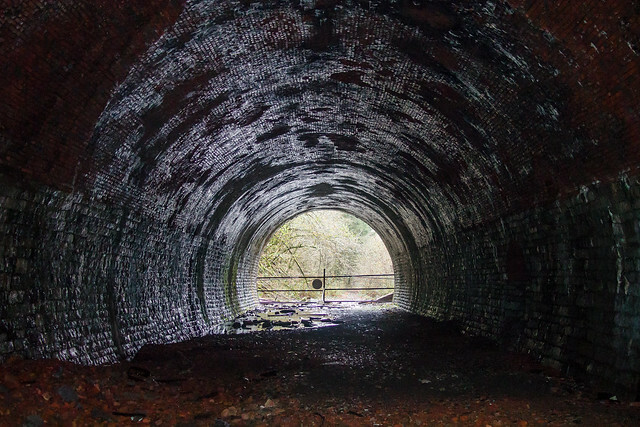 I especially took some pictures of the tunnels, but not of the packrafting part. The rest is your imagination. The map below is the guide if you ever feel ready to complete this round trip. 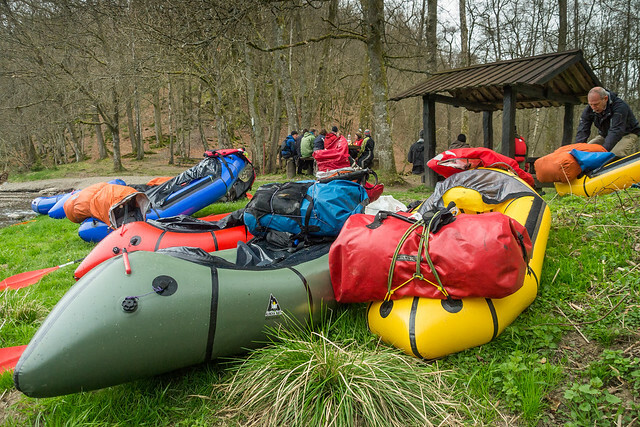 However, keep in mind that packrafting on the rivers in the Wallonia part of Belgium is regulated by law and is depending on the actual discharges. 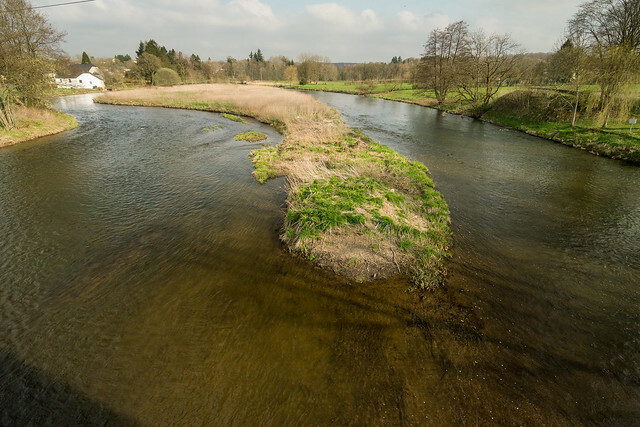 On this site you can check which river sections are open. We had 5,5m³/s on the Vierre at Straimont and 29m³/s on the Semois at Chiny. Putting in on Ruisseau de Grandvoir, a small side stream of the Vierre river. 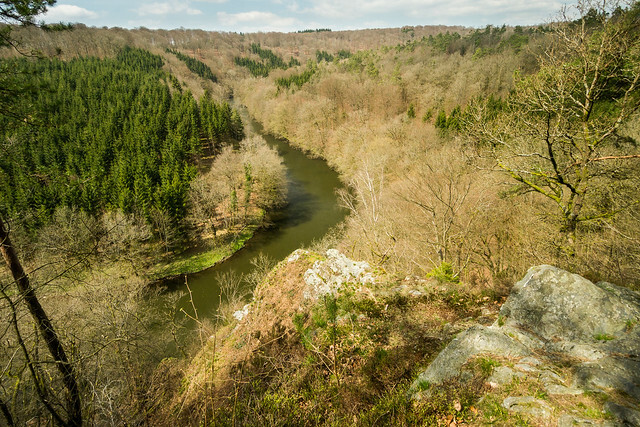 Hiking above the Semois river.